World Animal Protection has responded to the desperate plea to save two 20-year old bears from years of confinement in a barren cage in the 'Olympic capital.' There has been outrage from people across the globe who see the suffering of these two innocent bears as abhorrent and unacceptable. This week, to mark World Wildlife Day, we have the opportunity to consider what we can do to protect not just these two bears, but the millions of wild animals that suffer as a result of the international wildlife trade and their subsequent exploitation at the hands of the entertainment industry. I've been reflecting on the power and importance of the individual animal and on why I believe conservation is a less effective approach when it fails to encompass animal welfare concerns. Animals like the two bears in Sochi, Russia, have been held in captivity since they were cubs and living (if you can call it that) in a filthy, rubbish-strewn bunker for the amusement of guests at a local restaurant. I'm determined that we will get the bears relocated to our partner organization Asociata Milioane de Prieteni, where the bears can spend the rest of their lives in comfort and dignity at their sanctuary in Romania. We're currently appealing to the authorities to work with us to free these bears. We have created a dedicated team that will work round the clock in cases like this, rapidly responding to the plight of individual or smaller groups of animals whose lives can be saved or improved through our intervention and campaigning. Given the international attention on the plight of the two bears in Sochi, it's surprising just how hard it is to get welfare concerns heard in one of the biggest issues affecting animals in modern times - the trade in wildlife. Issues surrounding wild animals are too often viewed through the narrow lens of conservation. This can create an incomplete perspective which fails to either acknowledge or, more importantly, address just how much individual animals suffer when they are poached, trafficked, smuggled and caged. The two Sochi bears represent a tiny window on the huge and growing problem of wild animals used for entertainment. But sometimes, it's the cases of individual suffering that tell the story a little more readily, and have the power to effect change for a far greater number. We know that in order to bring about improvements for the lives of the greatest numbers of animals possible, we have to fight for space at the table to get animal welfare issues debated. This could be through major global initiatives like the UN Sustainable Development Goals or in the animal welfare practices of major multinational corporations. We're already working successfully with tour operators, such as Intrepid Travel, to change the way in which they see the use of animals in entertainment. We've done this by highlighting the systemic cruelty behind elephant rides and the growing awareness about the welfare of captive tigers in tourist attractions in Asia. These are just some indications of how far the scope of animal welfare has expanded in recent years and the different fronts on which we now have to engage. The public are already backing our mission to succeed in saving these Sochi Bears and so we will continue to shine a light on both individual cases of cruelty and the devastating impact of trade which is fast depleting many species to extinction. World Animal Protection has always had large-scale aspirational and transformational goals for millions of animals, but yet we can also never turn a blind eye to those individuals still suffering daily around the globe. All of these animals, no matter how many or how few, suffer in silence, and World Animal Protection will continue to speak out for them as loud as we can. 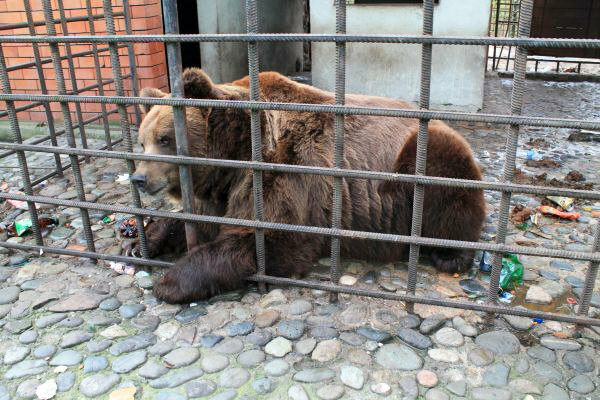 Help free these defenseless bears and sign the petition.